Liz Howard, Ali Blythe, John Reibetanz, A.F. Moritz, John Barton, Catherine Seton, Anita Lahey, Jan Conn, Alisha Dukelow, Shane Rhodes, Gwen Benaway, Amanda Jernigan, Stephanie Bolster, Rebecca Păpucaru, Janet Rogers, Stewart Cole, Paola Ferrante, Marc Di Saverio, Mariah Lynne Dear, Julie Mannell, Shane Neilson, Katie Fewster-Yan, Catriona Wright, Robin Richardson, Claudia Coutu Radmore, Joshua Whitehead, Neil Surkan, Adam Sol, Mary Dalton, Peter Richardson, Danielle Hubbard, and Kayla Czaga. Plus we have 5 poems by Acadian poet Herménégilde Chiasson (with accompanying translations by Jo-Anne Elder), And we have two full colour sections, one a fully illustrated version of one of Anita Lahey's poems (think graphic novel meets poetry) and the other eight pages from the Erasing Frankenstein Collective. What is the Erasing Frankenstein Collective, you ask? Well, according to project co-ordinators Elizabeth Effinger and Sue Sinclair, "This experiment in collective authorship weaves many different voices together with that of Mary Shelley, our source author and central voice. The project includes incarcerated and non-incarcerated members of the Walls to Bridges Collective (W2BC) — an organization dedicated to providing educational opportunities for incarcerated people — as well as students and alumni from the University of New Brunswick. Together, participants have performed a book-length erasure of Shelley’s Frankenstein." 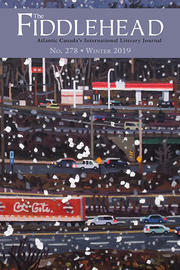 In addition to the poetry, we also have book reviews by Richard Kelly Kemick (Collected Poems of Alden Nowlan, edited by Brian Bartlett), Lynn Davies (Then / Again by Michelle Elrick), Emily Skov-Nielsen (Other Houses by Kate Cayley), Susan Haley (Admission Requirements by Phoebe Wang, dust or fire by Alyda Fisher, and 3 Summers by Lisa Robertson), and Mark Dickinson (Otolith by Emily Nilsen).